Mr. Herman Michael Hackstock, age 100, passed away Wednesday, September 6, 2017. He was born in Hamilton, Ohio on January 5, 1917 to Mathias & Theresa (Reitter) Hackstock and served his country in the US Army during World War II. He married the former Rosemary Schroll, and after her passing he met and married Norma Townsend on August 25, 1984. Mr. Hackstock had been employed as an electrician for IBEW Local 58 - Detroit for 33 years until retiring in 1978. 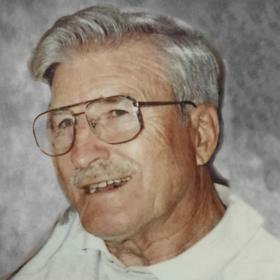 Herman was a member of United Lutheran Church, past member of the American Legion and IBEW Local 58 Retirees and Widows Association. Herman enjoyed farming, gardening, woodworking, playing cards, and traveling, including winters in Florida. Wife of 33 years, Norma; sons, David (Mary) Hackstock of Troy, daughter, Mary Lu (Ronald) Herron of Lake Orion, Judy Hackstock of Ferndale; stepson, Joe (Mary) Townsend of Traverse City; stepdaughters, Shelley (Steve) Heyblom of Grand Haven, Toni (Michael) Slater of Mesick, Lisa (Allan) Fraser of Ontario; grandchildren, Scott (Linda) Herron, Jeffrey (Kiira) Herron, Bradley Herron, Toby (Sara) Hackstock; great grandchildren, Alexa Herron, Lucas Herron, Magdalena Hackstock; 4 step grandchildren; 4 step great grandchildren; sisters, Kathryn (Joe) McCrea, Dorothy Miller, Elsie Kraai; many nieces, nephews, cousins and friends.. He was preceded in death by his parents; first wife, Rosemary Schroll; brother, Albert; sisters, Ruth Hackstock and Irma Kern; brothers-in-law, Milton Miller & Earl Kern. Saturday, September 9, 2017, 11:00 am at United Lutheran Church with Pastor Earl Merz officiating and Military Honors. Interment in Holy Sepulchre Cemetery in Southfield. Friday, 2:00 pm to 4:00 pm and 6:00 pm to 8:00 pm at Clock Funeral Home-Grand Haven. MEMORIAL: United Lutheran Church.